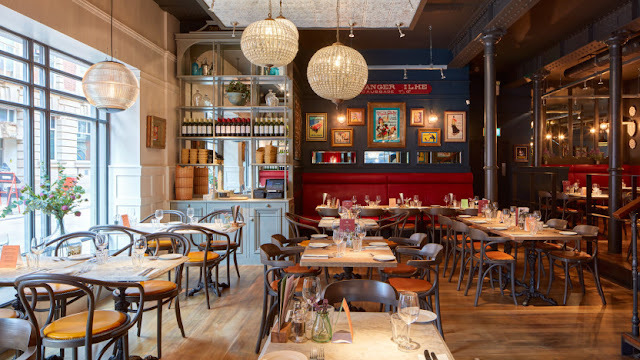 Bistrot Pierre provides great provincial French cooking in relaxed and friendly restaurants across the UK. It's a restaurant that for years I've glazed by and never gave an opportunity to, the 'French' cuisine kind of terrifies me (I usually think of snails!) so when I was invited to sample some of their food I jumped at the chance to try something new. The food on offer is Anglo-French, a combination of English and French flavours. The dishes are freshly prepared by their chefs daily by using carefully sourced ingredients from local producers and artisan French producers and suppliers. The restaurant does offer classic Bistrot favourites within their menu alongside some seasonal dishes too. 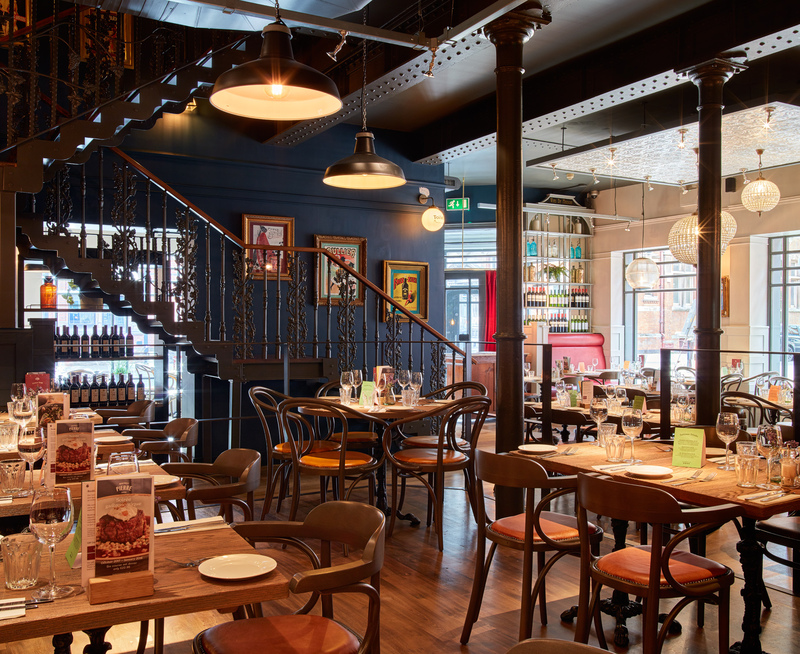 The restaurant in Leicester has recently undergone a refurbishment which has completely transformed the space into an intimate, comfortable place to dine. The light sound of music alongside the noise of conversations between diners makes for an enjoyable experience. 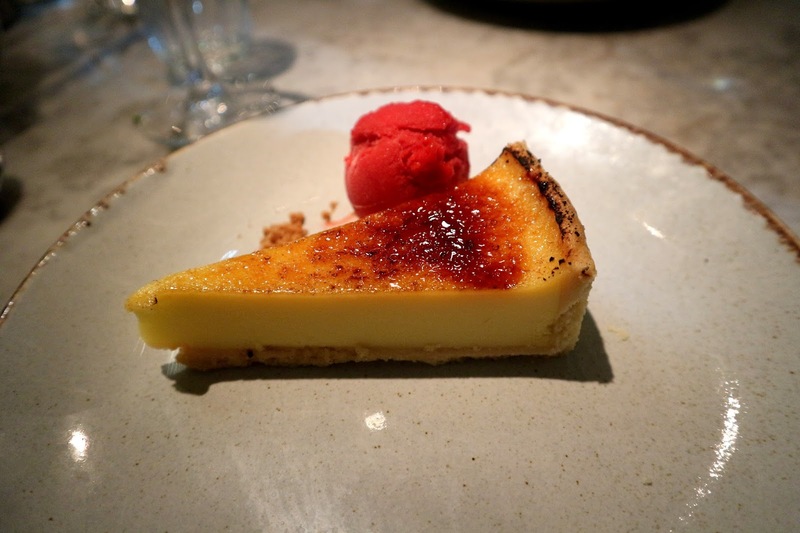 The food we tried came from the A la carte menu, inspired by the owners travels around France, the dishes are a real taste for French Bistrot dishes and there were lots to choose from. 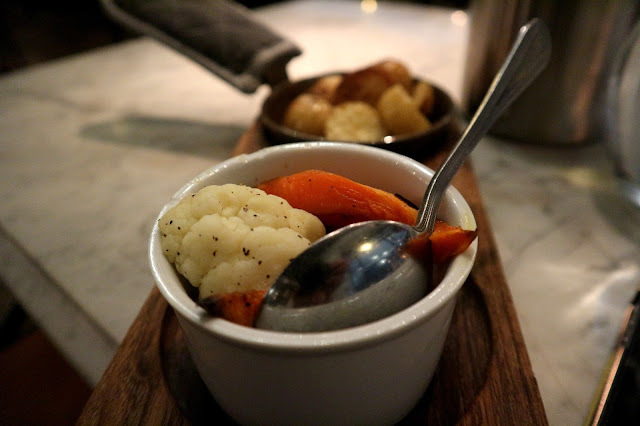 We got straight into the starters where my dad opted their freshly made soup of the day, it was a combination of Tomato and Pepper flavours and would be a great winter warmer dish. 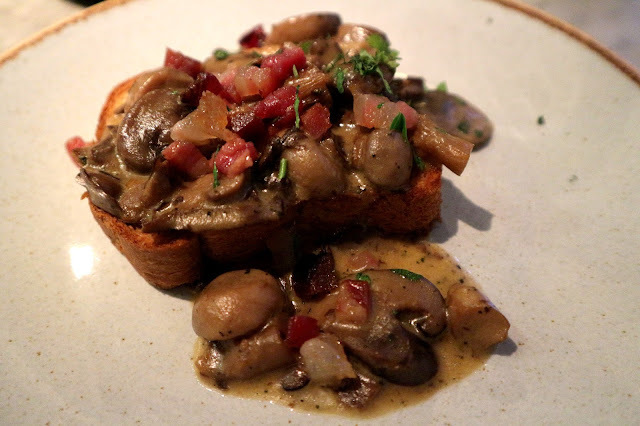 I sampled the Brioche et Champignons, a dish that was made up of toasted brioche with fricassee of mushrooms and bacon. I thoroughly enjoyed my dish but was glad for the extra appetisers of bread because there was a lot of mushrooms and bacon to eat. It was the perfect quantity for a starter without overdoing it before the main course. Choosing a main dish was difficult because there was so much to choose from! I opted for trying something new and gave the Croquettes de possion a go. 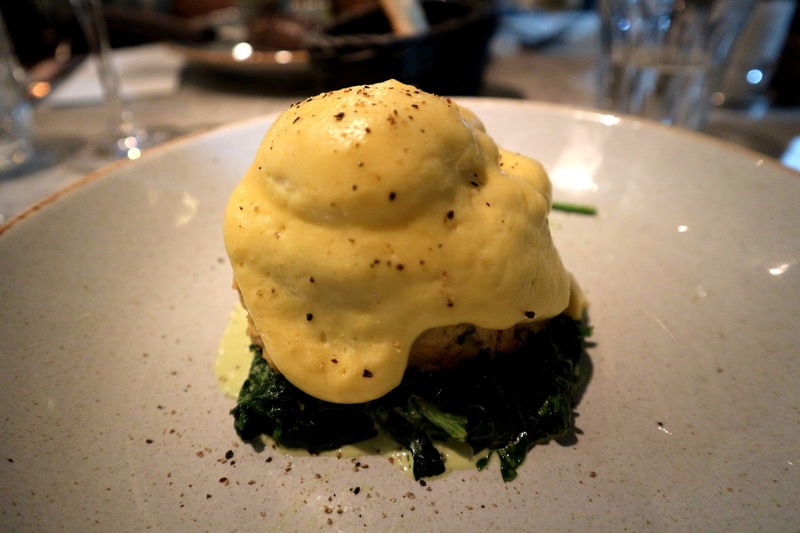 This dish is a fish cake with sauteed spinach, soft poached egg and hollandaise. The combination of flavours was not what I expect ed at all and thoroughly enjoyed popping the egg yolk and mixing it with the fishcake and spinach. The only downside to the dish was that there was so much food that I couldn't quite finish it. 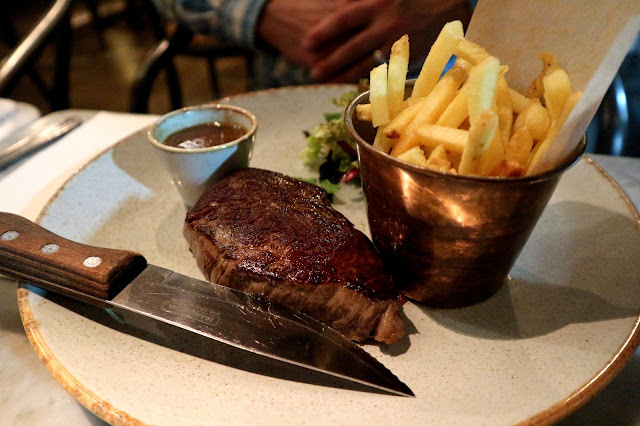 For my dad's main meal he decided to try their Pave de Steak which was a delicious 8oz rump steak with chips. All of the food came well presented and in good timing. 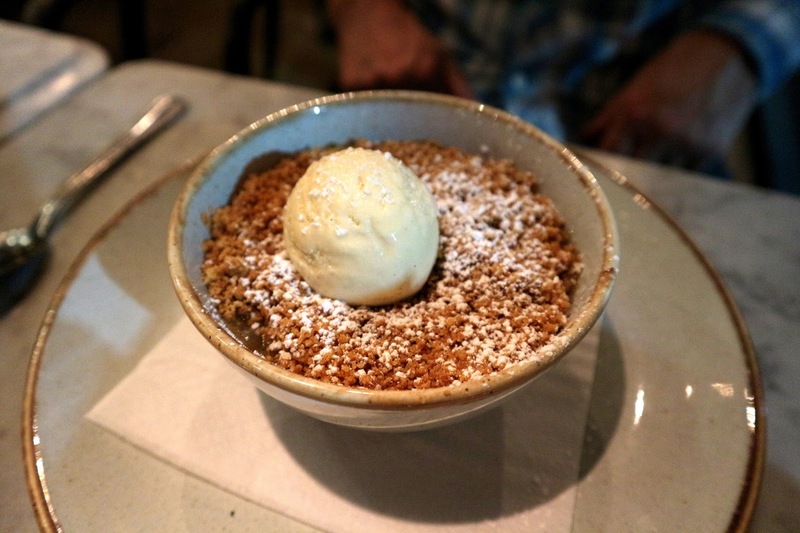 As there's always room for some kind of pudding, my dad opted for the comforting taste of the apple and rhubarb crumble, Crumble aux pommes et rhubarbe which will be the perfect pudding choice as we draw closer to Winter. I decided to go for the Tarte au citron, a delicious caramelised lemon tart, served with raspberry sorbet. The flavouring was sweeter than I expected them to be for this dessert but it was still a delicious choice to finish off the dining experience. 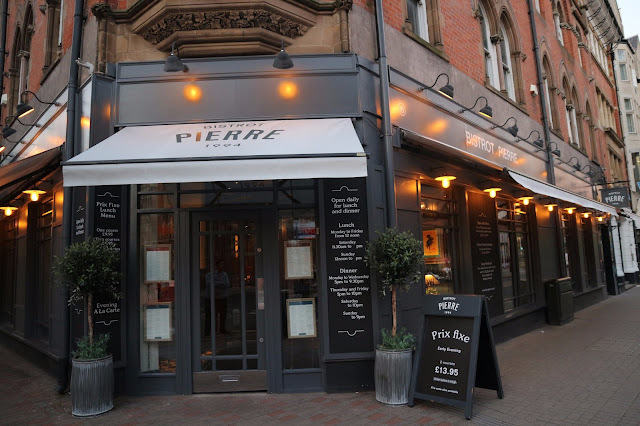 All in all, I thoroughly enjoyed sampling the menu and atmosphere at Leicester's Bistrot Pierre. The staff were very attentive to our experience for the entire evening and made us feel extremely welcome. *Restaurant Review. Invited to review Leicester's Bistrot Pierre Menu. All photos, views and words are my own. Wished I could travel and visit that place. The food and ambiance seem nice!